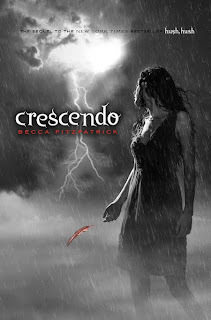 First Novels Club: Crescendo Cover! But I guess everything will come back when I start reading the second one! Love the cover and can't wait to read the book! I can't wait to read this book! I have a feeling the Crescendo ARC is going to be a hot commodity! I can't wait for this book. The cover looks good but you are right it's hard to beat a shirtless Patch. Amen on the begging for an ARC! P.S. You have an award over at my place Frankie. The cover will never beat the original...but it still looks amazing and will be added to my collection! Taschima, you'll have no problem Im sure! Pirate Penguin, I know, I LOVE it, but is it better than Hush, Hush, so hard to say, yet soooo gorgeous. Tara, oh I know!!!! I have my fingers crossed but we'll see what happens! Christine, hehe shirtless Patch all the way! Dawn, we'll just keep begging together and awww thanks!!! Julie, I think you're right and me too!!!! Crazy awesome cover!!! She IS lucky with those. I wasn't a big fan of Hush, Hush, but the covers for this series are gorgeous.